Those inspiring words by the French novelist (hat tip to our friends at California’s SoCal Wine Country Women’s Half for finding them) speak to why women-only races have grown so quickly. In 2013, the most recent year we have solid numbers for, women made up 61 percent of all the half marathon finishers in the U.S. — nearly 1.2 million people, a number I’d expect to rise even higher in 2014 when RunningUSA’s annual report comes out later this year. It was my wife Meredith’s idea to highlight races for women in this week’s newsletter, and I quickly agreed: I ran Jacksonville’s 26.2 With Donna a few years ago, and I saw then the special and unique camaraderie it offered, which you don’t find at other races. Hope you agree — and please reply if there are any races I missed! Designed for women only, this race starts and finishes just blocks from the Alamo and features long stretches along the San Antonio River, with very gradual elevation changes — as well as fresh pancakes, tacos, fruit and chocolate at the finish line. 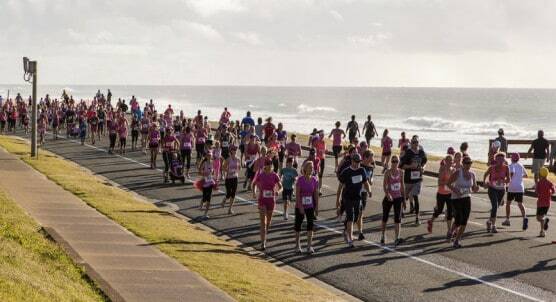 More than 12,000 runners from all 50 states and several countries converge on northern Florida each winter for this race, subtitled the “National Marathon to Finish Breast Cancer.” Men may enter as well as women, and you get to run a mile on the Jacksonville beach. Named for the magazines that sponsor it and organized by the New York Road Runners (which hosts the NYC Half and New York City Marathon each year), this women-only race sells out regularly and unfolds entirely within Central Park, starting and finishing next to Central Park West. More than 2,000 women cross the finish line each year at this springtime race, which in past years has been timed to coincide with the anniversary of Title IX, the landmark 1970s law that mandated equal treatment for women in education and athletics. Organizers tell entrants to bring their daughters, moms, sisters, aunts, nieces, grandmothers and friends to Bend’s Happy Girls Run, which starts and finishes in Riverfront Park and features long stretches along the city’s scenic Deschutes River Trail and Cascade Lakes Scenic Byway. This event is one in a 10-race nationwide series in which you’ll find feather boa and tiara stations out on the course — so if the spirit moves you and you haven’t brought your own, you can “glam up” with the gear many other runners will be wearing during the race. Billed by organizers as Southern California’s original trail race designed just for women, the SoCal Wine Country race features challenging terrain — the steep and rocky hills around Temecula’s Vail Lake Resort — and sometimes challenging weather, as temperatures can reach the 90s this time of year. Designed to celebrate and encourage women — but also open to men — this race lives up to its name with a roughly mile-long stretch down the Windy City’s world-famous shopping avenue, and starts and finishes in Grant Park overlooking Lake Michigan, next to the iconic Buckingham Fountain. Starting next to the city’s Soldiers and Sailors Monument, this race unfolds through downtown, the campus of Indiana University and along the White River. Men are encouraged to cheer on their wives, daughters, sisters, mothers, girlfriends, grandmothers and friends, but participation is open to women only. Created “by women, for women of all ages, all abilities,” this start-of-fall race unfolds entirely within Belle Isle State Park in the middle of the Detroit River, and benefits Go Red for Women, a social media outreach effort designed to empower women to take charge of their heart health. Probably the event that put women-focused races on the map, this race (now one of 19 Nike Women’s races worldwide) sells out within hours and draws some 20,000 finishers annually for a run through the Presidio and Golden Gate Park, starting in Union Square and finishing on Marina Green. Finishing out the year as the event organizers say is Houston’s sole women-only half marathon, this fast and flat race runs two loops through Alexander Deussen Park and Eisenhower Park at the southern end of Lake Houston, just northeast of downtown. I ran the Publix Savannah Women’s Half last year and LOVED it. It has all the perks of a big race, in a smaller, more manageable package. Additionally, it was one of the the most scenic half marathons I’ve ever run. For more details on the race, check out http://www.serialrunner.com/half-marathon-race-recaps/publix-savannah-womens-half-marathon.